The Dakota people are among the most widespread indigenous cultures in North America. Their historic range covers five different states in the modern United States and two provinces in Canada. Stretching throughout the Upper Midwest and southern Canada, Dakota people live in Minnesota, North Dakota, South Dakota, Nebraska, and Montana, as well as Manitoba and Saskatchewan. 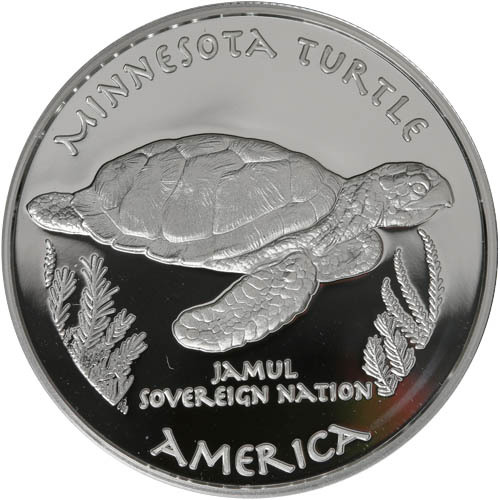 Today, the 2019 1 oz Proof Silver Minnesota Dakota Turtle Coin is available to you at Silver.com from the Native American Silver Dollar Series. Available to ship to you inside of a protective plastic capsule! Fifth design in the 2019 date mark issue and the 25th overall in the collection! The face value of One Dollar is fully backed by the Dakota. A tribal elder from the Dakota is featured on the obverse design field. A turtle is depicted swimming through a body of water on the reverse field. Issued for the Dakota people. Represents Minnesota in the series. Not legal tender coinage in the US. The Dakota people are typically divided into Eastern Dakota and Western Dakota cultures. The people of the Western Dakota are known as the Yankton or Yanktonai on a broader basis and reside throughout the Upper Missouri River area. There are several federally recognized tribes within this Dakota cultural group. Many of the Dakota people living in Minnesota are from the Eastern Dakota culture, or the Santee. This cultural branch also has various federally recognized tribes residing throughout the eastern Dakotas, northern Iowa, and large portions of Minnesota. All 2019 1 oz Proof Silver Minnesota Dakota Turtle Coins in this product listing come to you with a protective plastic capsule. The coins have a nominal face value of One Dollar, but do not have legal tender status in the US. These proof silver coins feature matte, frosted design elements with mirrored background fields. 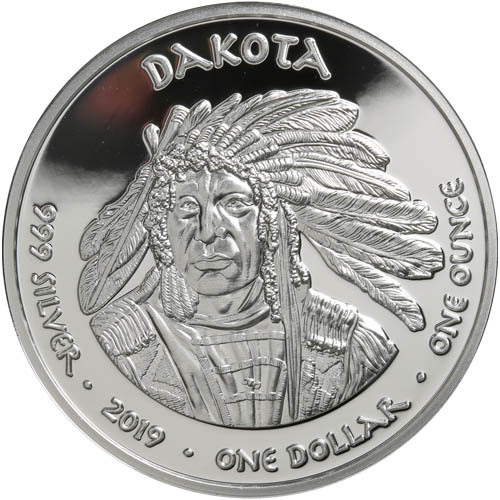 On the obverse of 2019 Proof Silver Minnesota Dakota Turtle coins is the image of a tribal elder with a full headdress. He is featured in a front-facing portrait with an engraving of “Dakota” above, and the weight, purity, metal content, date mark, and face value inscribed below. In Minnesota, many of the Dakota people are from the Mdewakanton tribe that historically lived around Lake Mille Lacs in the central portion of the statue. The Mdewakanton are a subtribe of the Santee people, which in the Dakota language is spelled Isanyathi. Translated into English, it is spelled Isanti, the name of a county in Minnesota just south of Lake Mille Lacs. The reverse of 2019 1 oz Minnesota Dakota Turtle coins features an aquatic turtle species. The creature is depicted swimming through the waters in one of Minnesota’s more than 10,000 freshwater lakes. Please don’t hesitate to reach out to Silver.com with questions. You can call us at 888-989-7223, chat with us live online, or email us directly.